Present scholarly conversations about early European and global modernity have yet to acknowledge fully the significance of Spain and Spanish cultural production. 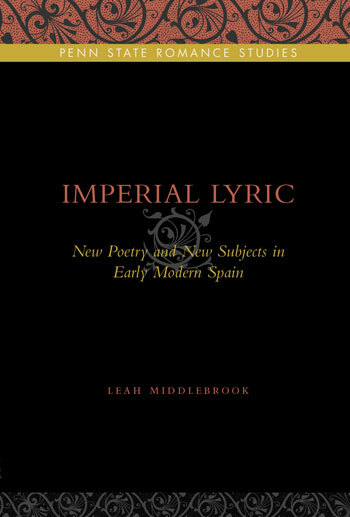 Poetry and ideology in early modern Spain form the backdrop for Imperial Lyric, which seeks to address this shortcoming. Based on readings of representative poems by eight Peninsular writers, Imperial Lyric demonstrates that the lyric was a crucial site for the negotiation of masculine identity as Spain’s noblemen were alternately cajoled and coerced into abandoning their identifications with images of the medieval hero and assuming instead the posture of subjects. The book thus demonstrates the importance of Peninsular letters to our understanding of shifting ideologies of the self, language, and the state that mark watersheds for European and American modernity. At the same time, this book aims to complicate the historicizing turn we have taken in the field of early modern studies by considering a threshold of modernity that was specific to poetry, one that was inscribed in Spanish culture when the genre of lyric poetry attained a certain kind of prestige at the expense of epic. Imperial Lyric breaks striking new ground in the field of early modern studies.